From Greg Wilson. Hopefully, someone like Rob or Michael (or one of Michael’s students) will step in and provide these kids some pro bono legal advice for dealing with a company looking to manage their online profile. LanSchool has requested that the Tony Targonski and Dan Servos remove the details of an exploit to an old version of their software be removed from the CompSci.ca wiki. I suspect that someone from LanSchool’s marketing and public relations team is tired of seeing the YouTube post showing up so high for a product that they no longer sell, and for an issue that has been fixed in the next version of their product. 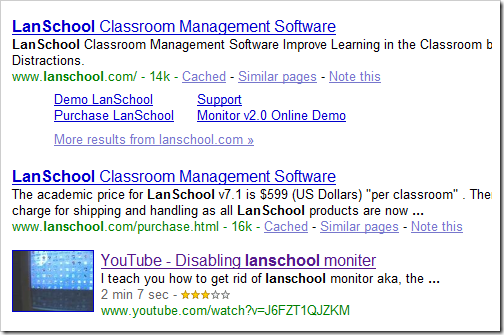 The YouTube video showing how to disable the monitoring program, is number 3 in my search for LanSchool. And the compsci.ca forums and wiki are in the top 5 when searching for “lanschool hacks”. (Funny how the compsci.ca don’t even show up in Live.com search). It is amazing how close the LanSchool software is to the classroom monitoring tools described in Little Brother. It should come as no surprise that I’m for the publication of these exploits, just read my call to action against Bill C-61 as a result of reading Little Brother. Dan has used his programming skills and his brain to learn about how not to program networked computers. By publishing his understanding and knowledge he has shared a bad software design with the intent that others can learn and not make the same mistake. Good work Dan! I’m sure from a traditional PR perspective this is a challenging situation. You have a product that has been updated to fix this bug among others while adding new features. The “community”, and this is a really funny term, has published a negative review and an exploit that shows vulnerabilities in your software platform. Perhaps the LanSchool marketing folks think that their software is unlike the rest of the world and has no bugs. Perhaps, they think it might be harder for kids to subvert their system if the exploit isn’t in the wild. It is an interesting PR case study, and unlike the Dell Hell experience and changes including IdeaStorm, I think this will just be another example of a large company doing bad PR. The publishing of software exploits is a question of freedom of speech. Hopefully we can keep kids like Dan and Tony doing intellectually stimulating things with technology. Dan and the founder of LanSchool, Dana Doggett, resolved the issue. You can read the history on the compsci website.